Mr Rooter Tip Of The Day: Most homeowners use a drain cleaning liquid. Usually these products are strong enough to partially dissolve a drain blockage. If you overuse drain cleaning liquids on a persistent clog, the chemicals can eventually damage or corrode your pipes. The Mr Rooter Trenchless Pipelining System is the alternative to digging and replacing sewer lines for residential and commercial properties. This technology eliminates root intrusion, repairs broken pipes and stops the inflow of sub-surface ground water. 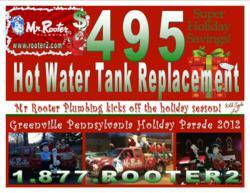 According to Pittsburgh plumber, Mr Rooter, a clogged drain can be a stubborn hassle. Strange noises, odors and poor water flow or backflow means the homeowner has a serious plumbing problem. For a drain blockage, how do you decide whether or not you need Mr Rooter’s professional plumbing service? “Common causes of pipe blockages include hair clumps, greasy buildup or tree roots interfering with pipe flow,” says Bob Beall, licensed master plumber and owner of Mr Rooter Plumbing Pittsburgh and Youngstown. There are many times that you can clear a clog by yourself. You can try pouring hot water and baking soda. Most homeowners use a drain cleaning liquid. Usually these products are strong enough to partially dissolve a drain blockage. Mr Rooter Plumbing recommends BioChoiceEs™, the”green-friendly” solution for healthy drain maintenance. TRADE SECRET: If you overuse drain cleaning liquids on a persistent clog, the chemicals can eventually damage or corrode your pipes. “Whether you have a stubborn problem or not, it’s a good idea to try to find out what is causing your clog. Be careful with the materials you let go down the drain. Installing a sink strainer will stop waste products from entering the pipes. Some stoppages, such as those caused by or tree roots, require the skills and tools of a plumber with the most innovative trenchless pipelining system available through Mr Rooter Plumbing. “When a drain won’t clear with chemicals, or a clog in your sink or tub keeps recurring, then you may really need to call the most referred and trusted Pittsburgh plumbing specialist, Mr Rooter. Tip #1 To rod a drain line, it will be necessary to find and open a cleanout closest to the clog. Tip #2 Very carefully and slowly open a small crack to see if there is any fluid underneath. If none, remove the plug. Tip #3 Insert a sewer tape into the line. Tip #4 Rent a high-powered rodding machine (very expensive by the hour and extremely aggressive to operate). A rodding machine will send a cutter head into the line. A foot switch (inset) is mandatory for safe operation. This procedure may take two men to operate, at best. Tip #5 If you are successful in clearing the main sewer line inside of your home or business, run a hose in the line full force for several minutes. This requires the pressure of your water to be reasonably high – professional plumbers use a Hydrojetting machine especially for this purpose. Video inspection is also available to investigate the sewer line from your cleanout to the street where the sewer connects to either the septic tank or the municipal service. WHAT CAN GO WRONG: After following Beall’s expert plumbing advice with no success in unclogging your sewer drain the problem most likely is between your house/business drain and the street. We offer a free second opinion on any plumbing repair service – including residential and commercial emergency plumbing repair. Mr. Rooter Plumbing offers 24/7 emergency drain cleaning services: Call 877-ROOTER-2 and a licensed Mr. Rooter plumber will be dispatched to your home or business immediately.